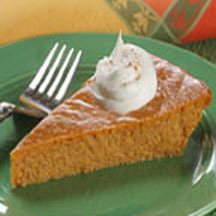 For some pumpkin pie lovers, the most important part of the pie is the creamy, pumpkin filling. Try this version of pumpkin pie without the crust, and enjoy more of what you love about this pumpkin holiday tradition. Prepare Filling: Combine sugar, cinnamon, salt, ginger and cloves in small bowl. Beat eggs lightly in large bowl. Stir in pumpkin and sugar-spice mixture. Gradually stir in evaporated milk. Pour into pan or dish.